The Huawei E5787 (also known as the Huawei Mobile WiFi Touch) is the first hotspot device sold by Huawei to provide with a LED touchscreen. It is a LTE Cat 6 device which means speeds as high as 300Mbps when you’re downloading, while upload speeds can grab as high as 50Mbps. The Huawei E5787s is decently sized, fitting into your palm. At just 7.5mm it’s super slim and weighs just 155g. The front of the device is made up of a LED touchscreen which enables you to operate the majority of features and settings without having to open up the Huawei’ mobile app or the web based UI. It also offers an interactive user interface that can monitor SMS messages, data traffic, Wi-Fi info, network status, and battery status at a glance. On the bottom, you have two external antenna ports to extend the mobile signal, a Micro USB 3 port to charge the E5787. On top, you have a power button. Popping the back cover off reveals a removable battery which you could change it. Battery life on the E5787s is excellent. The main reason that up to now all other hotspot devices supported the slower speed of Wi-Fi was the battery life. The faster the speed the device supports, the shorter its battery life gets. The E5787 is equipped with a 3000mAH Li-pol battery that keep working for almost 12 hours, and the standby time could be 600 hours. 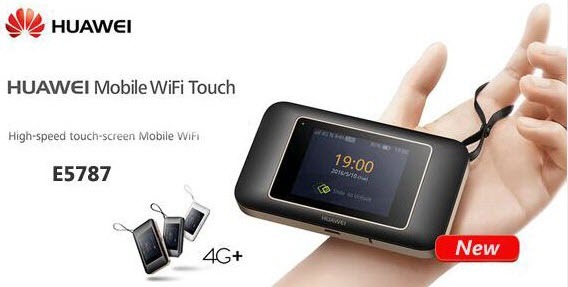 Compare to its predecessor Huawei E5786 MiFi of the same battery capacity, this E5787 provides longer use and standby time by inserting a new chipset to reduce the consumption of power and extend the working time. Dual band 4G wireless routers have the capability to transmit on the 5 GHz and 2.4 GHz wireless band. Huawei E5787 is such a 4G mobile hotspot device that supports true dual-band, meaning it works on both the 2.4Ghz and 5Ghz frequency band at the same time. It provides the ultimate in flexibility and performance by providing two independent, dedicated networks. Active Battery: 3000mAh removable Li-ion battery. If high-speed data is a must where ever you are, Huawei E5787 4G hotspot is one of those gadgets that should probably be in your arsenal. It is an excellent mobile hotspot for anyone who needs the internet while on the go; with support for to get the best out of 4G today, and ready for more 4G into the future. Previous Previous post: Huawei E5787 VS Huawei E5786: What’s the difference?